On a Saturday afternoon, I cut through the crowd milling near Insa-dong and headed toward Anguk Station, late for class. I tried to quell my impatience with the pedestrian light that seemed to stay red forever and my annoyance with myself for not being punctual ― after all, it was a class on Zen Buddhism. Chastising myself, while rushing to get there, didn't quite seem the embodiment of Buddhist nature. But as I enter the Ahnkook Zen Center and climb its bright, sunlit stairwell, those emotions seem to fade into the quietude of the modern, four-story building. I slip quietly into the Buddha Hall, bow to the prominent statues of Buddha flanked by two bodhisattvas and settle on a cushion amongst the other participants. Held on Saturday afternoons, this class designed for foreigners welcomes everyone from those curious about Zen to experienced practitioners. There are about a dozen of us today ― the number varies by week ― and we are a diverse group representing different parts of the world and varying levels of familiarity with Zen. Among frequent participants are several Koreans who practice at the center regularly. After the meditation, Lou Morrison, a 54-year-old from Kansas and the teacher of the group, writes the word ``mind'' on the blackboard twice ― first in lowercase and then in capital letters. The first refers to the psychological mind, which is burdened by the realm of suffering. MIND, or true mind, is a person's Buddha nature, the essence of which is unmoving. Morrison, a professor of English at Kukdeong University, North Chungcheong Province, has been leading the group for about five years. He has been studying Buddhism formally since 1996, though his personal experience with the subject matter stretches back to 1980. He has studied and taught extensively; and it was while teaching a course on the history and iconography of Buddhist Art at Choggye Temple in Seoul that he formed the relationships that led him to teach at the Ahnkook Center. In a sonorous voice that rises in pitch to accentuate his points, he explains how the two types of mind are connected, that without one, the other can't exist, like yin and yang. The good news is that it is possible for the mind to progress to MIND. The text provides a jumping-off point for the discussion. Our ensuing conversation includes comparisons between Buddhist and European philosophers; the sharing of challenges and revelatory moments experienced during mediation; relevant examples drawn from everyday life, movies, and books; and a story Morrison tells about the time, on a trek in northern Nepal, he met an old monk who lived in a small temple in a cave. Our discussion, as usual, flows over the allotted time. We continue over tea and fresh fruit, though the conversation skips away from Zen to other topics: our work lives, travel, the weather this time of the year in our hometowns. This relaxed time, at least to me, embodies the concept of ``Sangha,'' which in its broadest sense refers to the community of practicing Buddhists. Sangha, together with Buddhist nature and ``Dharma'' (the teachings of the Buddha) comprise the ``Three Jewels'' that practitioners of Buddhism take refuge in. It is pleasant, of course, to sip tea with those I've become familiar with over the few weeks I've been attending. It should be noted, however, that many who visit the class come just once and don't return, their curiosity about Zen perhaps satiated. Morrison, in an e-mail interview with this writer, said these one-time visitors are equally as welcome and important to the group. ``I do not feel any loss if someone comes only one time, but a great gain," he wrote. ``The most important thing in anyone's life is to hear the Dharma for the first time, to hear something of it, because it will become a ``bamboo shoot'' later in life (as in ``Samsaric'' life, not just this one lifetime). At dusk I walk out of the center, past the hanok buildings of Gahoe-dong, towards the city center. The feeling of sangha goes with me, as does a week's worth of food for thought. And, at least for now, the pedestrian-light eternity seems like nothing at all. 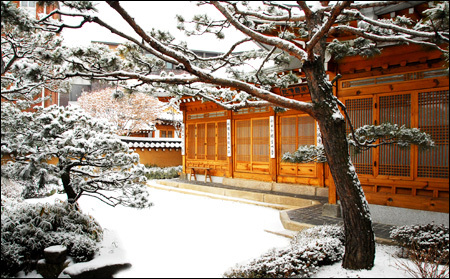 Ahnkook Zen Center was founded in 1989 by Zen Master SooBool Sunim to teach the practice of Ganwha Seon, an official Zen method of the Jogye Order of Korea. It has some 3,000 members at its Seoul and Busan centers and strives to ``liberate people of all countries in the world through the practice of Zen,'' according to its Web site. The class in English is held Saturdays from 2:30pm to 5:00pm. It will be held for the next two weeks before its winter break. The class will reconvene on the first Saturday of March. For more information, visit www.ahnkookzen.org/English or call (02) 744-0772.